The Great Backyard Bird Count is this weekend. I have been participating for a number of years. My son is an avid birdwatcher (at almost 9!) and so we count birds together. With all the snow we have in Virginia right now I fear our numbers may be low, but we'll be out on Saturday watching and listening. For those preparing to do a little birdwatching this weekend, this is a perfect time to read about birds. There are so many great bird books for kids that I simply don't know where to begin, so I decided to focus today on some of my favorite books of avian poetry. First, let's start with some titles written by Jane Yolen with photographs by Jason Stemple. To get a feel for the depth and vibrancy of the images in these books, be sure to check out some of Jason's bird photos. Wild Wings: Poems for Young People - The first collaboration between Jane and her son focused on birds, this collection of 14 poems was inspired by the stunning photos. Fine Feathered Friends: Poems for Young People - The second book on birds in the Yolen-Stemple collaboration includes even more gorgeous photographs and inspired poems in a variety of forms. 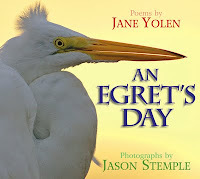 An Egret's Day - The latest collaboration (and 14th book by Yolen and her son!) focuses on the egret. That neck! Those feet! Photos get up close and personal and allow readers to see this magnificent bird from every angle. Poems full of metaphor and keen observation tell us much about these birds. Also included is factual information. Here are a number of additional titles I use when teaching students about birds. Bird Watch, written by Jane Yolen and illustrated by Ted Lewin - Yolen's familiarity with birds is clearly evident in this collection of 17 poems. Accompanied by the artwork of Lewin they practically soar off the page. The Company of Crows: A Book of Poems, written by Marilyn Singer and illustrated by Linda Saport - I find crows fascinating, and it's obvious that Singer does too. In this collection of 23 poems crows are viewed from the perspective of crows, other birds, animals, and people. 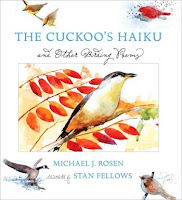 The Cuckoo's Haiku: and Other Birding Poems, written by Michael J. Rosen and illustrated by Stan Fellows - The bird in this collection are introduced by season, beginning with spring. The spare form works well in these poems, highlighting each of the 24 bird species in delightful ways. The illustrations are elegant and nicely complement the text. Feathers: Poems About Birds, written by Eileen Spinelli and illustrated by Lisa McCue - My favorite poem EVER about a woodpecker is in this book. It's one of the 27 short, rhyming poems that mark this playful collection of verse. Readers will also enjoy the feathery facts at the end of the book. I Am a Phoenix: Poems for Two Voices, written by Paul Fleischman and illustrated by Ken Nutt - While on poem in this book refers to the mythical creature in the title, the remaining 14 poems provide a look at the world of birds all through the day and night as they engage in a variety of activities. 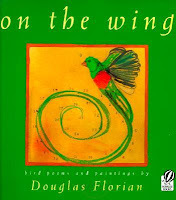 On the Wing: Bird Poems and Paintings, written and illustrated by Douglas Florian - This collection of art and poetry examines 21 birds with witty word play and a keen sense of observation. Today at the Bluebird Cafe: A Branchful of Birds, written by Deborah Ruddell and illustrated by Joan Rankin - This collection of 22 poems does a fine job introducing readers to birds with personality. The poems are funny and sweet and set against the most pleasing and whimsical illustrations. Wings on the Wind: Bird Poems, selected and illustrated by Kate Kiesler - Kiesler's beautifully painted birds and landscapes accompany poems that largely focus on wild birds, though there are a few odd inclusions, such as the poem about the pet parakeet or the one about the pirate's parrot. The balance of the collection provides readers with a nice introduction to the wonder of birds. While penguins won't make anyone's bird counting list here in North America, I can't leave this entertaining volume of poems off the list. Antarctic Antics: A Book of Penguin Poems, written by Judy Sierra and illustrated by Jose Aruego and Ariane Dewey - This one is fun and sneaks in quite a bit of science. Readers will find some predator riddles as well as poems that celebrate and explore the lives of penguins. A new book in my TBR pile by Sallie Wolf is entitled The Robin Makes a Laughing Sound: A Birder's Journal. It includes poetry, sketches, watercolors and more. The book is just beautiful and looks like a nice resource for kids interested in keeping their own nature journals. While I don't usually recommend adult books in these lists, here are two poetry books you'll find worthwhile, despite the fact that there is a bit of overlap in the selection of poems. 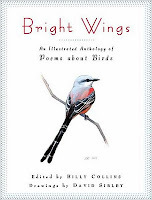 Bright Wings: An Illustrated Anthology of Poems About Birds, selected by Billy Collins and illustrated by David Allen Sibley - I adore this work for its inclusion of classic and contemporary poetry on birds as well as its scientifically accurate (and gorgeous) illustrations. On Wings of Song: Poems About Birds, selected by J. D. McClatchy -This is a huge anthology with every manner of bird, from hummingbird to albatross. You'll also find such poets as Dickinson, Plath, Poe, Keats, Yeats and many more. Finally, you might enjoy this article from the Guardian books blog. Here is an excerpt from Adam O'Riordan's piece entitled Why Are Poets So Fascinated With Birds?. What is that draws poets to birds? And why have so many turned to them at critical points in their own writing? The collective nouns we all remember from childhood speak of language's innate fascination with all things avian: a murder of crows, a murmuration of starlings, a parliament of fowls. And it's no coincidence we afford them the most poetic collective nouns: right from the birth of literature birds have been present. Have I missed one of your favorite books of bird poetry? If so, please share. I'd love to know what you've been reading. Great list! I recently acquired The Cuckoo's Haiku, a new favorite. I'm also thinking of the picture book Birds by Kevin Henkes and Laura Dronzek, which reads like one long poem. A beautiful nonfiction book I like that's out of print is Birdsong by Audrey Wood and Robert Florczak. Oh My. So many nice books here. We're getting two new bookcases next week and I've put aside some money to treat ourselves to a few new books (not that we need them because we've got so many books on all other surfaces in this house - hence the 2 new bookcases), and I fear that a large amount of that money may now go on books from this list! Another bird book (not poetry but oh so lovely) I would suggest is The King of the Birds by Helen Ward. It's an age old story but her illustrations are so very very beautiful. Thanks for featuring my son Jason's and my books. A great honor. I might point out a book of mine often overlooked: A RING OF EARTH which is four linked poems about an bird or animal that represents a season. In that book winter is ermine, spring is spring peeper, summer is the dragonfly, and full the goose. It is (in my opinion) the best poem about a goose that I have written. And I have written many! Again, honored to have led off your bird poems post. My late husband-- avid birder, bird recordist, and the original Pa in my other bird poem book OWL MOON--would have been so proud. I am honored to have my book, The Robin Makes A Laughing Sound, included in this list. And I love Deborah Ruddell's playful poems in Today at the Bluebird Cafe. Great list! Thanks. I had planned to do a post about books of bird poems last April--but never got around to it. Two other books of bird poetry I have are MARSH MORNING by Marianne Berkes and UNBEATABLE BEAKS by Stephen R. Swinburne. Both books are classified as nonfiction--but they're written in verse. How's the weather down in your neck of the woods today? I'd add Brenda Guiberson's stunning nonfiction picture books, including SPOONBILL SWAMP, THE EMPEROR LAYS AN EGG, and MUD CITY. One of my favorite bird reads is RARE ENCOUNTERS WITH ORDINARY BIRDS by Lyanda Haupt. Tricia -- you and your son must come to Shangri-Lar to watch the Bald Eagles with us someday! I'm always recommending The Cuckoo's Haiku for gift-givers. So beautiful, as are so many of these books. Thanks for this great list! We are starting a unit study on birds soon, so I am excited to have some great additions to our reading list.